The NDP’s victory in the May 2015 Alberta election stunned many Albertans and Canadians, even many party supporters. The shock was not so much at the PCs’ defeat, but rather that it came at the hands of the social democrats. 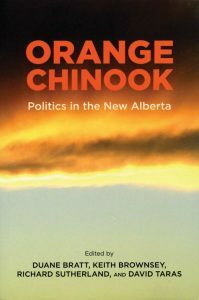 Edited by Mount Royal University professors Duane Bratt, Keith Brownsey, Richard Sutherland and David Taras, Orange Chinook examines, over 18 chapters of varying quality, the 2015 election and how the NDP has governed since, with a tentative look at the future. After Sutherland’s brief introduction, part two of the book lays out why the NDP won. In a recurrent theme, Taras examines the Tories’ fateful relationship with the oil industry, while Bratt recounts the weaknesses of the Jim Prentice-led Progressive Conservatives going into and during the campaign. Tory weakness, and that of the other erstwhile challengers, might suggest the NDP won by default, but Melanee Thomas, in one of the book’s strongest chapters, argues the NDP won because it was prepared, professional and persuasive, and led by Rachel Notley’s effective and credible performance throughout the campaign. As shown by pollster Janet Brown and co-author John Santos in their chapter, voters shared this assessment. Part three deals with the related issues of oil, the carbon tax and pipelines. Journalist Gillian Steward compares Peter Lougheed’s activist policies with Ralph Klein’s laissez-faire approach to the oil industry and—not surprisingly—suggests Notley’s approach harkens back to the Lougheed model, but updated to such current realities as recognition of the rights of Indigenous peoples and environmental concerns. Steward’s chapter provides a nice bridge to Kevin Taft’s chapter that succinctly links the science, economics and politics of the carbon tax. These two chapters help explain the NDP government’s seemingly contradictory actions in defending the carbon tax at the same time as it is now a chief booster of pipelines. Other multi-chapter sections focus on NDP governance and Notley’s governing style. Brownsey contends the transition period following the election went extremely well due to Alberta’s capable civil service and the NDP’s willingness to work with it. Economists Ron Kneebone and Jennifer Zwicker then lay out Alberta’s long-term and ongoing fiscal rollercoaster resulting from an over-reliance on resource royalties. In a final chapter, Anthony Sayers and David Stewart examine the demise of the PCs after the 2015 election and the rise of the United Conservative Party, arguing that the PCs’ burial was not a certainty, but a political choice. Noting that the Progressive Conservative party governed for nearly 44 years because it was a “big tent” party, Sayers and Stewart suggest its demise has caused Alberta—at least in the short term—to become more politically polarized. The book is consistent on several broad points. First, Rachel Notley was—and is—the key to the NDP’s success. Second, the NDP is in many ways the offspring of the Lougheed Conservatives, albeit mixed with a blend of prairie and social democratic populism. And third, Alberta is going through a social and economic transition away from oil dependency that will continue to roil its political terrain for some time to come. Orange Chinook is not without flaws. There is a hurried and uneven feel to some chapters. 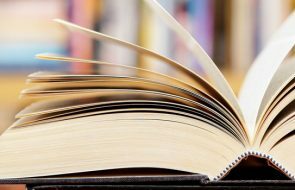 Some readers may also wonder at the book’s Calgary-centric choice of authors: Fourteen of the 22 authors have connections to the University of Calgary and its Mount Royal counterpart, seemingly replicating along academic lines the province’s political divisions. For all that, however, Orange Chinook provides a useful baseline for considering the future of Alberta politics. —Trevor Harrison is the director of the Parkland Institute and a professor of sociology at the University of Lethbridge.